Over the past 2 weeks, the cryptocurrency market has been showing a scattered price range, wherein Ethereum is currently moving sideways. However, other big coins such as XRP and Lumens [XLM] are traveling fairly horizontal. At the time of writing, Ethereum is staying in the green zone, only up 0.07% with a trading price of $210.15 and a market cap of $21.5 billion. In the scenario of the 1-hour ETH candlesticks, the trend lines ranging from $235.6 to $215 and $197.5 to $212.4 are about to converge to form a triangle, leaving a little space for stability. The lines are indicating towards a breakout in the current market trend of Ethereum. The Awesome Oscillator has been flashing green, suggestive of a bullish market. Furthermore, the lines are aligned above the 0-mark, predicting a healthy trading price. The Bollinger Bands just returned from a wider route to form a narrow tunnel. Currently, the indicator is opening its neck again, subtly signaling towards a volatile market for the cryptocurrency. The Parabolic SAR is bullish on the market as well. As observed, the dots are aligned beneath the ETH candlesticks, uplifting the current price trend. 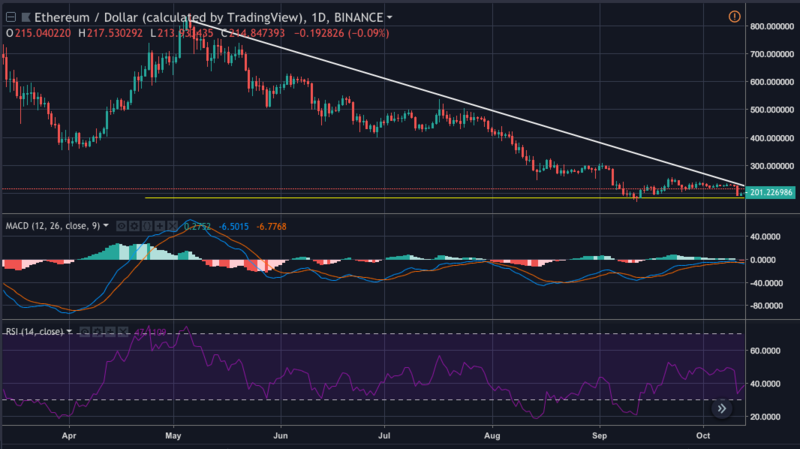 The 1-day price candles of ETH are experiencing a downtrend at the moment. The support is set at $182.4, forming a descending triangle with the resistance line ranging from $822.1 to $214.9. Therefore, the resistance is showing much dominance in this case over the support, keeping the price at the edge. MACD made a bearish crossover by the signal line but soon took an upward approach, currently refusing to cooperate in terms of prediction. It has joined with the signal and is sitting at the intersection point as of now. Meanwhile, the RSI has fallen flat and is floating in the middle, after almost touching the oversold zone. However, the indicator is apparent to be bearish more than bullish, as it is swimming a little on the lower side. The technical analysis suggests that the prices might go slightly up in the short-run but eventually take a sideways approach in a lengthier period of time. Not many indicators used above have shown a clear sign of either a bullish or a bearish ETH market.